The Capital Region is located in the eastern part of mid-New York State, covering 5,199 square miles and includes the Albany, Troy, Schenectady and Saratoga areas. The region is comprised of eight counties and is known for its large and vibrant economy with a particular focus in biotech life sciences and nanotechnology. 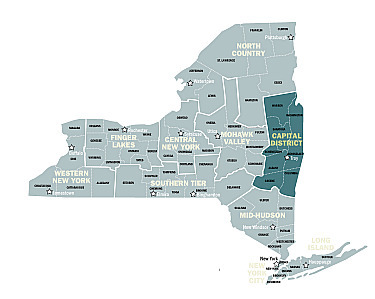 The Capital Region possesses characteristics and a strategic location that positions it well for economic growth in high tech and knowledge-based industries. The confluence of the Hudson and Mohawk Rivers, the transportation hub formed by the intersection of two major interstate highways, excellent proximity to the markets of the northeast and an engaging quality of life all combine to endow the region with unparalleled economic development potential. The region’s human capital – a population of 1.1 million and a workforce of 568,600 is arguably its most significant asset. The New York State Thruway connects the region with New York City, the Massachusetts Turnpike (I-90) and western New York State. The Northway (I-87) links the area with major destinations to the north and to the Canadian highway system at Montreal. Interstate-88 provides the region access to the southern tier of the state and to the Pennsylvania markets. As the major air center for the Capital Region, Northeastern New York and Western New England, the Albany International Airport offers a wide-range of facilities and services. A multi-million dollar capital redevelopment project completed in 2000 included a new 230,000 square foot terminal, parking garage, Air Traffic Control Tower and cargo facility. Passenger service is provided by Air Canada, American Eagle, Continental Connection, Continental Express, Delta Airlines, Northwest Airlines, Southwest Airlines, United Airlines, US Airways and US Airways Express. The Albany Port Railroad Corp. provides service under the supervision of CSX and CP Rail systems. Amtrak, CSX and CP rail systems provide the region with both passenger and intermodal freight facilities, servicing the Northeast, Mid-Atlantic states and Canada with connections nationwide. Ocean-going vessels dock at the deep-water port of Albany Rensselaer, located 124 nautical miles north of New York City on the Hudson River. A 32-foot channel makes the port accessible from the sea year-round. Ships up to 750 feet long and 50,000 deadweight tons are serviced by the port. The New York State Canal System connects the area with the Great Lakes ports of Buffalo and Oswego. The Capital Region is home to 25 colleges and universities offering over 740 degree programs from the associate to the doctoral level. The region also has an outstanding selection of community colleges. Offers negotiated flexible electric rates for many types of new businesses, negotiable gas transportation rates and fixed rate gas discounts. Offers fixed rate electric discounts for many types of new businesses and market based gas pricing. Offers negotiated flexible electric and fixed rate electric discounts for many types of new businesses and negotiable firm gas transportation service.